Lava International Limited, introduced exciting offers for Lava A1 customers in association with Vodafone-Idea Limited, the largest 2G Telecom entity in India. 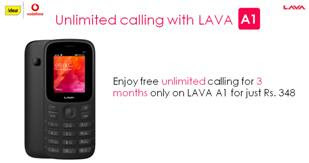 Lava A1 is the bestselling feature phone from Lava. This collaboration between Lava International and Vodafone Idea Limited will further provide exciting benefits to all Lava A1 users. Under the scheme, the owners of Lava A1 can recharge for Rs.348 to enjoy unlimited local & national calls even on roaming for 84 days. This prepaid recharge also provides customers with 100 free sms per day. New customers coming on Vodafone-Idea network can avail the same benefits with the first recharge of Rs. 351. This scheme will be available across India until March 31, 2019. The Lava A1 is equipped with remarkable features like contact icons, instant torch, 3-day battery backup extended with Super Battery mode, superior sound quality with big boom speakers and support for all 22 Indian languages. Its slim and compact design makes it stand out in the feature phone category. Lava A1’s exemplary quality is also backed by outstanding service promise of 1-year replacement guarantee.